Castella Fine Architectural Hardware source distinctive and versatile cabinet handle designs from around the world. Our aim is to provide you with choice in finishes so that you can be creative in the styling of your cabinetry and stay ahead of the trends. 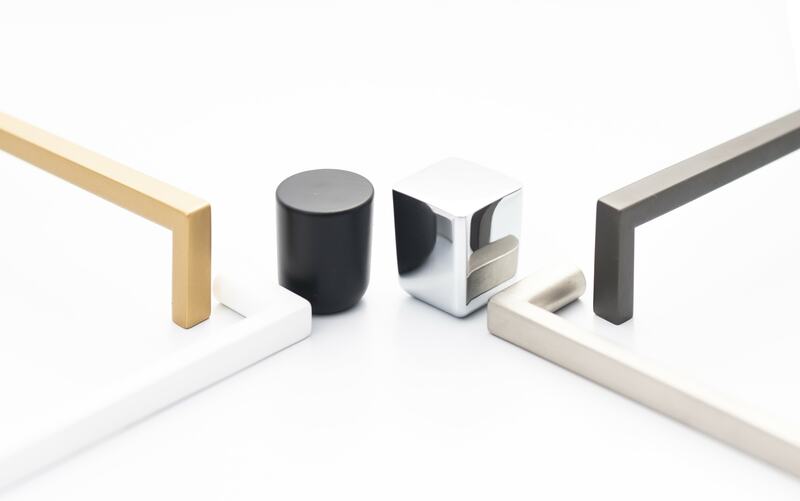 Castella’s range of handles and knobs come in a wide variety of finishes. The new Urbane Range has introduced two new finishes into our portfolio; Satin Gold and Graphite. Both satin gold and graphite can be used to make a subtle statement or create a bold look in the design of your space. Paired with design accents and soft furnishings, both finishes are an asset to the architectural finish of your home and surroundings. Satin gold is a new finish which is a particular favourite at Castella. High end products are often accentuated by gold and the quality of our satin gold Urbane handles provides a delightful alternative to the gold of years past. The satin gold lustre infuses a sophistication into the Urbane handle. Urbane satin gold handles can be combined with cabinetry that is dark and moody or light and bright to give you completely different styles and aesthetics. While satin gold is arguably part of a new trend away from previous metallic finishes such as rose gold and copper, it provides an elegance that will stand the test of time – particularly as a beautiful and refined finish paired with structured and simple shapes. Graphite Urbane handles have a versatile appearance that is best described as a mix between matt black and stainless steel. With appeal, graphite is sure to take over the from the previously popular brushed nickel- as the finish of choice for both designers and home owners. Although graphite can be seen as a masculine finish, the curved profile on the back of the Urbane handle lends a softness to the finish. A perfect pairing, this adaptable range gives you the opportunity to introduce a finish that is more subtle than matt black. Graphite presents a fresh alternative to the standard finishes of chrome and dull brushed nickel. Appealing to both modernists and traditionalists, this timeless finish is sure to impress the designers of today’s era. Satin gold and graphite finishes are an exciting addition to the Castella product ranges. Presenting customers with a durable and timeless finish, both satin gold and graphite have been combined with the gentle structure of the Urbane handle to create stunning opportunities for architects, designers and homeowners.